I just started using this up two days ago and so far I am extremely impressed. Still learning my way around it, but it is very user-friendly and incredibly well put together. Thank you! Great App! Including Dev Support! I never have been able to get myself to do this kind of tracking before and the app is making the difference. And when I thought the app was missing something and reviewed it here, saying so, the dev got back to me with help right away. Turns out the app had what I needed all along. Great app, great support. Thanks! I love this app. My only complaint is that it doesn’t sync with my fitness pal. My dream app would do both-track micros and symptoms so I wouldn’t have to track twice -I know-I’m so needy! that is a feature i would pay for :) Otherwise it’s a great app! There’s a lot that can be done with this app. Unfortunately, it’s impossible to narrow the focus because you can’t edit categories. That makes it unwieldy and hard to use. I’d have loved to have emailed the developers, but they have no email listed and I do not use, nor host on my phone, the app required to send them an email in the app. How hard is it to list an email, really? I’ve been using this app for over a year and it’s been great! I’ve tried many other similar type apps and this one is by far the easiest and most useful. If you have health issues I highly recommend this app. Excellent way to keep track of what I eat instead of just trying to memorize everything I did. I wish they would add a line for weight as I weigh myself each morning to also track that. Other than that, it works fine. It’s cumbersome at times to type in the food - but no-mater what app you use you would still have to do that. Since my phone is with me all the time it’s way easier than carrying a notebook and writing everything down. I love the way it orders events when you adjust the time. I was drinking a protein shake every morning with 3 or so ingredients in it and like clockwork, I’d have an upset stomach 30 minutes later. Obviously, it was something in my protein shake, yet the app missed it or claims those ingredients had a low chance of being the culprit. Aside from that, it claims “fruit” is my number one culprit for every single symptom that’s logged with “high confidence” but I’ve never logged “fruit.” I have logged frozen cherries, avocado, and banana- but all of those specific ingredients, while being “fruit,” show only medium to low probability. So I’m not even sure how it is coming up with that? The concept it great though and I hope over time, the algorithm gets better. Really wanted to love this app! ***updated*** Giving this app another try after learning how to add new items. Will update my review when I see how it works. I have high hopes! I am so disappointed. I was really hoping this app would help me but it doesn’t allow you to add ingredients and since it is missing even common ingredients such as green onions (not listed under scallions either). I have to follow the Autoimmune Protocol diet and it very restricted. I am forced to eat and cook with lots of ingredients not in the app. This wouldn’t be problem if I could add ingredients but there isn’t any way to do so. I downloaded three apps to manage IBS and this is the least bendable in adding foods throughout day, the options of including other aspects of IBS (BMs, stress, anatomical) not part of this app or is easy to access. And I have a masters degree in information. I wanted an app to help me with FODMAP elimination and trigger identification. I have used My Fitness Pal in the past to help keep a general food diary. When that app was new, it was free as users helped create its database, now arguably the most comprehensive. This app’s food database is lacking and the method for entering foods or a recipe is frustrating. I cannot understand why you have to manually enter every item that is in thirds of the unit of measure. You cannot repeat medications or meals simply. Frankly, this app would not be a bargain even if it was free. 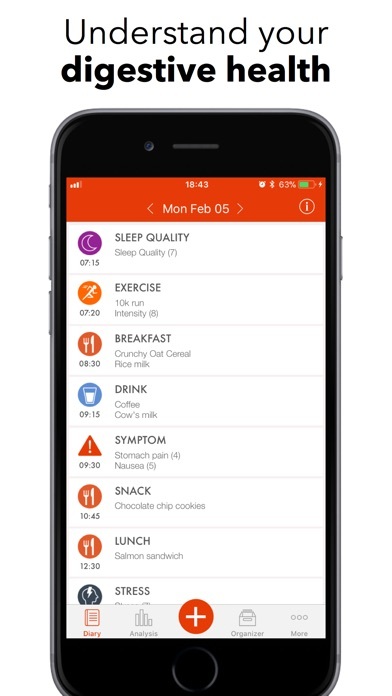 It’s packed with features that you’ll discover after you’ve tracked your food and symptoms for a while. The analysis it does is awesome. Am I charged every month for this app or is it a one time charge? This app has been extremely helpful for tracking my food and symptoms to help me make connections. It's easy to use also. This app makes it easy to record everything I eat. The bar code scanning brings up most brands I buy. It predicts the foods as I begin to type based on the time of day and frequently eaten foods. When I forget to record something, it’s easy to modify previous days entries. The analysis tools seem helpful, although I have only recorded a week of data so far, so there aren’t strong trends...which is what I’d expect. Great app! First time I have reviewed an app because this one is so necessary for anyone with chronic health issues. It is the most robust, flexible and sophisticated option for tracking symptoms and getting analytics to help you find correlations. As with anything like this, the data is only as good as what you enter, e.g. to get really good data, you have to keep religiously entering information when you’re not having symptoms. I really hope they continue to improve the app and add more automation. I would especially like to see options to import data from Apple Health, Watch and other apps, e.g. automatic logging of environment events based on location and weather data. Nonetheless, it’s a phenomenal app and very helpful if you are diligent about data entry. I love this app because I can track just about anything. With IBS-C, it can be very difficult to pin down what causes flare-ups, and while I JUST started using it, I can already see some interesting correlations in just a few days of tracking. The “Other” category is really important, too, because I can use it to track things like where I am in my cycle, or when I ride public transit (which can give me motion sickness as times). I’d ask the developers to include a way for women to track the very basics of their cycles because of how much it can relate to digestive symptoms, but I understand you can’t add everything to one app, and again, I can just use the “Other” category. Looking forward to the day that more foods are added to the database, but I’m happy to be contributing as I go! Great app! Very useful for someone like me with IBS who needs to pay attention to what I eat, and the reaction to my body. Also useful for weight loss and just being mindful of what’s going on in your body for overall health. This is the best app. I have in’s and I use this to track my foods. It does such a great job. I love how you can track symptoms, medications, and bowel movement. It is great for everyone. It is not just an app for staying fit and losing weight, it is for everyone! Works Great and Very helpful for Daily Journal!! I was going to try to make a spreadsheet that would do all this. Thank goodness I didn’t have to! I am using the ap to manage Crohn’s symptoms and food intake to share with my doc as we adjust meds. This is such an important and helpful tool. I am so grateful and appreciate the reasonable price. Maybe I’m just dense, but the first 3 or 4 items I looked for weren’t in the database. I was looking for generic terms like roast beef, French roll, etc. I had the app on my phone for all of 3 minutes before I deleted it. It has been a real struggle for me to properly keep track of my symptoms and what I've eaten plus when I take my medications. I couldn't be more impressed with this app, my favorite feature is the unlimited amount of symptoms you can track. I've purchased other apps where they give you a maximum amount of symptoms, such as 5. Then they require you to pay more to upgrade. It's ridiculous. Thank you for making my life so much easier, and for helping me and my doctor keep track of my life. This is perfect! I’ve already discovered another possible food sensitivity, which means everything to me! Thank you! I am so disappointed. I was really hoping this app would help me but it doesn’t allow you to add ingredients and since it is missing even common ingredients such as green onions (not listed under scallions either). I have to follow the Autoimmune Protocol diet and it very restricted. I am forced to eat and cook with lots of ingredients not in the app. This wouldn’t be problem if I could add ingredients but there isn’t any way to do so. If you are trying to manage a lot of symptoms (or even a few) this is the best app I’ve found for helping to figure out and identify the causes of common digestive and stress related problems. The database of food items is quick and easy to use/add and they have a barcode scanner to quickly log things. Absolutely love using this app! It’s a must get! This app is just what I needed! I am 60 yo woman who is not computer savvy so it took a few days of entry to figure it all out. Exceeded my expectations. App looks to have great features. Two issues in first 5 minutes prevented input of daily data. Submitted issues report. There are problems though. Their food database is very limited. I admit I haven’t used it religiously and would probably like it more, if I did, but the food database is so limited that I find it easier to log food and notes into the MyFitnessPal app. Obviously the problem there is the whole or main purpose for this app, which is to find out what’s making you sick. I will use it more frequently when they upgrade the database. Needs to be able to sync with the cloud and across devices on iOS and Android. User profiles with a login would be a good idea. I was recently diagnosed with IBS and this is a life saver. This app is so easy to use and well worth the money. The attention to detail, speed and fluidity of the app is excellent, and it is sooo easy to personalize. And the fact that it spits out a beautiful PDF is amazing!!! I had to wait to see the dietician for a while after my diagnosis but she was very impressed with the PDF. It has most every food, but can’t find a couple things when I enter them. Not to be too cheesy..... this app helped me feel less alone and less embarrassed to talk about poop because clearly other people have to deal with digestive issues too. Great app! Thank you for making it!! U have to include more items on the menu I have had to add my own items but I’m not sure what to put forball the entry areas when it shows that page? Best food tracking app available. I have tried several. This one is the best. I like the app overall, but there needs to be more options when adding recipes to the database. After spending tedious time inputting diurnal food and dietary supplements that I take on my iPad I learned that this application does not such with my other devices. The Company processed synching over a year ago. Without synching, it is worthless. There’s a lot that can be done with this app. Unfortunately, it’s impossible to narrow the focus because you can’t edit categories. That makes it unwieldy and hard to use. Did I review this before? It’s great. Needs to be able to store data on cloud bcs I lost 2 years of data when my phone crashed. Other than that it’s been incredibly helpful in my healing.. I’d also like to be able to copy an entry to add it to another users day- I added my daughter as she is also healing from Lyme & mold but it gets very tedious. It would be helpful to be able to post a meal in my account then copy and add to hers instead of adding everything all over again. No real complaints tho. I use this daily. Love it. Very detailed and helpful and I like that we can add notes to everything. I’d also like to see a tab for weather. It would be incredibly helpful to have a few more colors- like the green for medications and red for symptoms is helpful but maybe add a light color for supplements and a different color for environment etc. thanks! —————— I love this app. Super helpful to keep tabs on what I eat and resulting symptoms. I have chronic Lyme, black mold toxicity, many food and chemical sensitivities. This is helping me to identify triggers and what foods specifically give me which symptoms. I've been adding a whole lot of foods etc so the database is growing. Tried to find a food diary and symptom diary to keep track during my FODMAPs diet. This was the first one I found so I got it. DON'T PURCHASE THIS APP. The UI is VERY confusing, and took me time to figure out how to use. I had to manually enter every single one of my foods and supplements, because somehow their database didn't have basic items like Oolong Tea and Probiotics. I lost my progress a bunch of times because of the confusing UI (it slows you to enter another food at the same time as you're filling out fields to enter a different food. Totally unnecessary and just makes it confusing). The design on the check items makes no sense (you're only allowed to press the literal check, and not the entire line or the name of the food). The tutorial was useless an didn't help me get a first grasp on the usability of the app. SAVE YOUR TIMR AND MONEY and download Cara instead. I found it after not believing this **** is the best thing out there and was so surprised to find a good app for free to do the exact same thing. If the app developers want to get it together they should run a user group and hire a real UI/UX designer instead of trying to build an app without paying attention to the inbox and user. Boooooo. Some standard foods (like vermicili noodles) aren't in their database, but they have some others that are unusual (like hake, a type of fish). I would actually pay for this app if it allowed me to scan barcodes and it auto-populated all of the ingredients. It can be time consuming to do so. There's a few other good options out there, but if you want comprehensive body tracking – everything from symptoms to what you eat – this app is for you. It's not the prettiest to look at, and doesn't have any Apple Health integration as of yet, but I'm hoping it will be updated soon. All in all, it's still a 5-star app in my book. Excellent work devs! Just what I needed! Love it! I was looking for an easy way to track my food and symptoms. This app is perfect! So easy to use. Like other reviewers, I don't understand the people that had challenges. I think they didn't understand the basic, simple functionality. I've only used it for a few days now, so I haven't gotten to try the analysis portion but I'm interested to see if that works. For me that's just a bonus. I'm thinking I have to figure out this food/symptom mystery on my own. Speaking of bonuses, the app stores what you've eaten recently for breakfast, lunch, etc. so if you eat the same thing, it's extra easy to enter. Great tracking tool for IBS. Helps manage my IBS. Analysis tools help me determine what foods cause the most issues. I have so many health problems and trying to figure out what is causing what is difficult for the specialists and I. I have found it easy so far and hope that I can figure out how to chart what each specialist needs. It allows for diversity of conditions by allowing you to add your own symptoms. I have lots of ideas for growth of this app and so far live it. This is the first review I have ever written. Keep up the good work! When I first downloaded, I wasn't sure what to expect. After using it, I was very impressed with the app and their support. Many apps just want your money but don't worry about the individual, not this one.... they are EXCEPTIONAL!!! Best money I spent on an app yet. This app is amazing and incredibly easy to use! The only thing I would consider changing is having more foods available to search. I got this app so I could keep a diary of food, symptoms, and mood. It's just right and will help my nutritionist and I use some real data to make sense of things. The only thing I might change is the ability to track fat, calories, etc. Really though, it's been a great tool. This was just what I needed to track my routine! This was just what o needed to track my routine. Excellent app! I like this app a lot! It has a lot of different factors you can add like, food, supplements, sleep, and a lot more. I have tried to keep food diaries in the past but having to hand write everything is very annoying. I started using it not too long ago so I'm not sure how the actual graph and everything will work but so far I'm super happy with it! 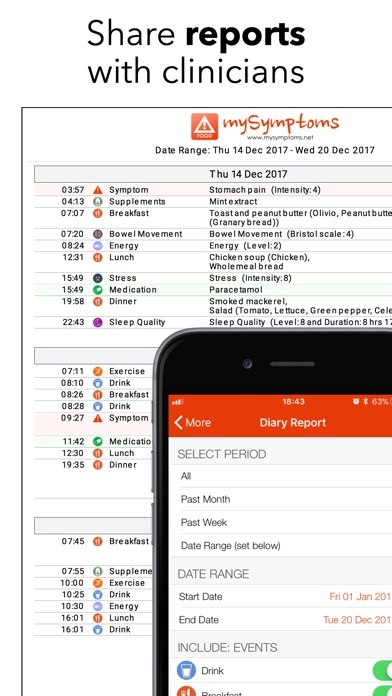 Perfect for being able to track food, symptom and severity - and have this specific/detailed information accessible for meetings with my doctor. I want to track my food to see what causes my hives. But I didn't realize you could only track the symptoms they have on their list. Also I might be allergic to a minor ingredient but I can't list anything that is not listed in their tracker. It's probably easier for me to just use a blank journal, too bad. Love this app to track foods and symptoms. The pdf report is an awesome feature. Have not used it long enough (only a few days) to get reliable information correlating foods with symptoms but fully expect that feature to be useful based on what I’ve seen so far. Only holding back 5 stars because there isn’t an easy way to trend symptoms ie graphical representation over time of number or features of bowel movements/ symptoms. This would be very useful in tracking IBD flares. Perfect app for what I need it for! I appreciate the amount of work that has gone into this app. Have only been using a few weeks but have been religiously logging my events and outcomes. Love how you can adjust the parameters and see correlations. That would be great if there were an online app and all instances of the app would sync across platforms. Otherwise, hats off top the developers - it beats having to enter all the information in a spread sheet - this is a timesaver! I like the app and initially thought it would be limited, but have been pleasantly surprised by how much is covered as far as the ability to track. You do have to input a lot, but that doesn’t bother me..I was already doing that, but a lot of what I’ve input is now available data. My biggest complaint is the lack of sync between devices. I have the app on more than one, but data only appears on one. Not going to input twice and doing backups constantly is a pain that only allows for one way transfers. I just started using the app, and I like it. It's a bit clumsy to input some of the data needed, but a lot of info is in their database. The stuff that's not takes a bit of a learning curve to create, and its done ONE STEP AT A TIME. But I'm betting that once the majority of info is inputted, it will be much easier for me. My biggest grip, at this time, is that i can't synchronize my data between my iphone and ipad. I just (maybe stupid on my part) assumed that I would be able to use whichever device is handy to input my data. And I DEFINITELY TO NOT WANT TO INPUT NEW DATA TWICE!!. I emailed the company about this issue and will get back to this review to update it when I get their response. Besides that, I believe it to be (while initially clumsy to get data into the database that is not presently there) a good app that will help me figure out the foods and symptoms correlation. I have Crohn’s disease and am now adjusting to living with about 3ft fewer intestines than I’m used to. I’ve had to make some major diet and lifestyle changes and this app has helped me keep track of it all. It can be tedious to enter in every little thing, but eventually, it starts to remember things you do regularly so it gets faster as you continue to use it. Helps me figure out what is causing my symptoms. Thanks for making it! Glad to add my wholesome choices to the database to support the app. Easy to add items. Hope you continue to develop the product as it has great potential. So happy I found this app! 5 stars all the way! Previously I was keeping track of my food intake on a google doc to figure out some health issues. This app actually makes it fun to keep track of your symptoms and general mood all day long. It’s brought a lot of awareness around my food choices and subsequent mood shifts. I love that this app doesn’t count calories. It’s so much more interesting to remove the concept of high or low calories and just focus on how a certain food makes you feel! Way more intuitive than tedious calorie counting. I think using this app will lead to weight loss although it’s not the primary intent of the app. Nice to keep track of food and symptoms but not the easiest way to go about it. Developers don’t want to figure out a way to make searching easier despite everyone complaining about the same issue. Analytics is lacking substance. Can’t actually SEND an email PDF of diary because the word “send” is grayed out. This is the same for sending an email to request help. I wasted sooo much time getting this set up for my symptoms and foods. With no ability to share with my doc, this is useless. Great App. Wish I could keep up logging my info and not do it intermittently. But that’s my problem, not the app’s. I bought this app a few years ago and at the time thought it was merely ok and subsequently forgot about it. But rediscovered it when I needed to start a food/symptom/sleep/&c diary for a doctor and was delighted to find that it had evolved into exactly the app I wanted when I originally purchased it. Simple interface but comprehensive tracking capabilities without calorie counting or other nonsense. Well done. I really like this app because I’ve been trying to figure out a good way to monitor some stomach issues and my migraines. I love that with a few clicks, I can have my symptoms, intensity and so much else right there, timestamped for review. I use this along with a photo journal where I track my food, and between the two I’m covered so I can be healthier and feel better. My wish list is only to have a photo food log here, too. Aside from that I’m glad I got this. This is easy to use and has lots of things to document. Really gives the whole view of lifestyle. With multiple food allergies causing a wide range of symptoms it is been hard for me to track which food is affecting me and which symptom is linked to which food. This app helps a lot. It was difficult at first to record and track foods and symptoms and to interpret the analysis. Eventually it becomes easier but at first it is a steep learning curve. Is this app perfect? No but it does steer me in the right direction and it’s easier than recording all this info by hand on reams of paper. Great app. Easy to add foods, and a wide selection are already included. Should add “gas” as a symptom. Need to add spell check/auto correct on food options. Adding food isn’t super intuitive, but it wasn’t too difficult. This would be fantastic if it added the nutritional values and could track that too. (like a My Fitness Pal). Combine the two so the user isn’t entering what they eat into two different apps. I'm writing a review in the hope that the maker will notice and fix this one problem. When you go to enter notes on any entry in the diary section, you cannot see the note you are typing. It is only visible after you click done. PLEASE find a way to fix this annoying error in an otherwise very nice program! This is the first time I’ve EVER reviewed an app, because it’s the first time I’ve ever been so impressed! The functionality is amazing— so much more than you’d expect for an inexpensive little app. The ability to toggle on/off certain configurations / ways the algorithm works / analysis period to find top suspects— is evidence of the care and pride into this app. I could not believe when I went on vacation, the times of each entry changed for that day, so I didn’t have to do any more work (ie, pretending to be on a different timezone that day) so my “X hours after” ingestion values weren’t wrecked— it just worked, without any human adjustment needed! Clearly someone has thought long and hard about every scenario, and taken steps to address it in the app. I think the ability to either create a new recipe or replace all previous instances of the recipe with your new entry is essential, and without it, I doubt the results would ever be accurate. Basically I’m blown away by this app!!!! I should note that I find technology intuitive in general. If you want a more beginner’s app, and you’re willing to trade functionality for ease of learning the app, maybe you’d want to choose a different one. Personally I’m so glad I didn’t. This app rocks!!! 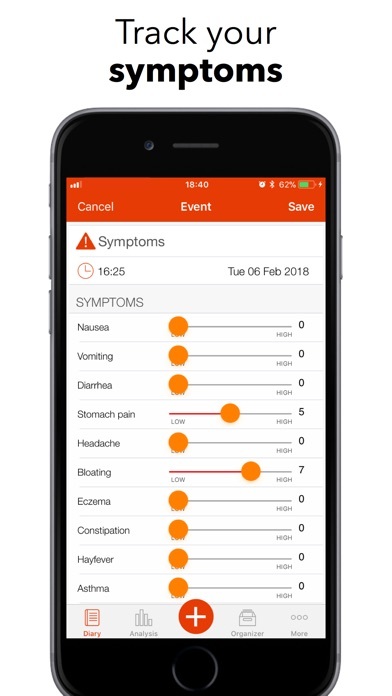 It’s a great app, I️ like that you can track bowel movements and other symptoms, such as headaches, which are a huge problem for me. The reason that I’m not going to keep using this app is that when I scan an item 95% of the time it comes up as not in the system and I don’t have the time to type in all of the ingredients on every item that I scan because there are so many freaking ingredients in everything. Unfortunately it just takes all the convenience out of this app, unlike an app like MyFitnessPal, which will scan 99% of everything. I’m going to keep the app for now and then come back in a couple months to see if this has been fixed. I really wish that I had read more of the reviews and just not looked at the overall rating. I downloaded this anticipating that it would be somewhat like my fitness pal or the like. Unfortunately the database food seems to be so meager that just for my breakfast alone I spent several minutes trying to type in various ingredients. Breakfast wasn’t anything crazy! It was a Starbucks coffee and a turkey bacon sandwich. The diary supposed to make this tracking of food and symptoms easy. Instead I’m spending a majority of the time entering ingredients. Very disappointed. Would not recommend unless the makers of the app are able to substantially increase the database of available food and ingredients. You’d probably be better served by making your own Excel spreadsheet and analyzing from there for now. I purchased this app to help track my diet for possible food intolerance because I really liked the idea of the ease of scanning a barcode to automatically add what I ate. (I usually don't pay for apps, I thought the convince was worth ~$3.) The issue though is that the amount of foods logged and connected to a barcode is not that impressive. Almost every food I've scanned, I've had to create my own instance of... On top of that there are not many "ethnic" foods already existing in the food library which is a real bummer. I am not sure I will continue using the app b/c it's ended up really time consuming to log every food. I like that the symptoms can be rated 1-10, and you can create, edit and sort your own symptoms. I love that in addition to tracking food, water intake, sleep and symptoms you have the ability to track energy levels, sleep, water, bowel movements, stressors and environment, and others. The bar code reader is amazing and the database learns them if they weren’t identified before. I still haven’t found whatever is affecting me but I think the App deserves 9/10. Now that I’m using it it’s okay There are some things that are hard to figure out!! I love this app. It has all the features we needed to identify a food intolerance for my son. I highly recommend this app for anyone starting to explore food allergies or intolerance. 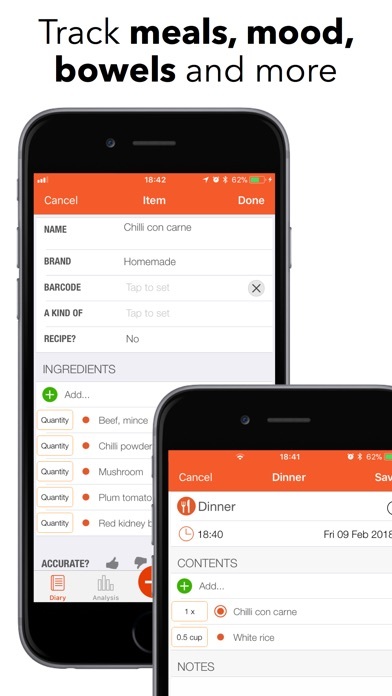 Great app, easy to track food and symptoms. Wish it could pair with Fitbit or MyFitnessPal because they show a lot more info about tracking food but not as easy of a way to track your symptoms. This app is very flexible to track the symptoms that I want to track! 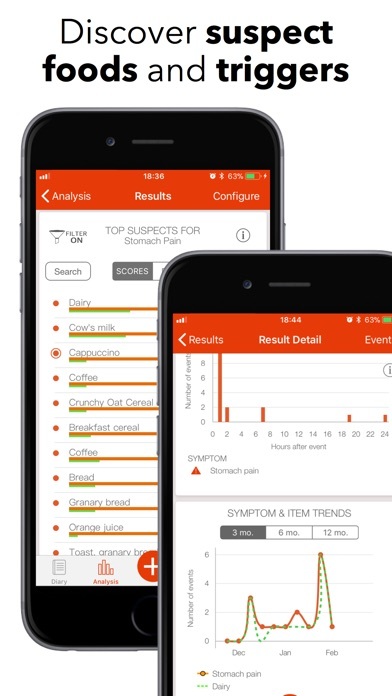 The best app available for troubleshooting dietary sensitivities! As an unashamed “app hoarder” I have only the best regards for this app. I have eliminated at least a half dozen other apps because it does what I once needed from all of them to accomplish in my day. There is more work for the developers to do but that is only because it is probably one of the most ambitious apps that the App Store has to offer. I do wish for a larger, smarter food data base and the ability to customize categories and entries with my own icons and pictures but I confess that I have become accustomed to those items because of apps that have been around far longer and for which I pay “premium” subscription dollars. I will gladly pay more for this app in the future if it means they can optimize all of the functions of this app. Note: The developers have been very helpful and responsive when I’ve reached out to them in the past. The interface does take a bit of time and patience to work through but the results outweigh the quirks. I’ve found that you can make this app as simple or as involved as you wish. I totally have molded it to work for me. I hope this app does well and that it will be around for a long time. I don't ever review apps, so that should say something about how great this one is! It's very easy to use and the reports are great for showing a doctor your symptoms! I wish there were more things in the database but that will come once more people use the app. I highly recommend for anyone needing to keep a food journal. I have tried COUNTLESS apps and notebooks but this is the only one that I actually kept up. Please add snap a photo option, it will help a lot. Also the email myself a PDF function is great. I bring my weekly report to my dr to adjust my diet and food allergy. It will much better if it also print out the ingredients of the food, otherwise there is no point to record the ingredients if it can't be printed out. This is a really good app. One thing keeping it from being great, though, is a way to “copy all” from one date to another. Sometimes I forget to put in my details for a couple of days, and then it takes forever to get it all in. And when you do a lot of batch cooking, like I do, you have a lot of repeat meals. Please add this function! Also—I would love to participate in the “feedback” option in the app, but it won’t let me because I don’t use an iOS based email. This leaves A LOT of people out, I’m sure. Otherwise, the best app I’ve found so far for recording foods and symptoms. I’m A private chef for a woman who has severe food allergies that change on a regular basis. I’ve been trying to figure out a good way to log food and keep track of reactions. There is a little learning curve to learning this app. I did feel the instructions weren’t completely understandable. Is there there away to sync 2 users of iPhones to the same diary without using iTunes?